I had the incredible opportunity to see Mark Zuckerberg interact with Senator Orrin Hatch yesterday morning at the BYU Marriott Center. 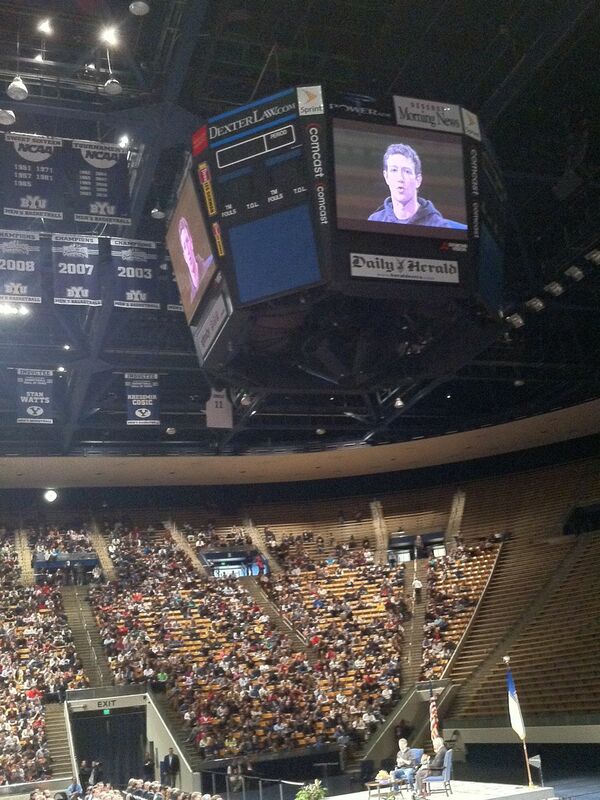 During the discussion, both fielded questions posed by students and others through BYU's Facebook page. More importantly during the discussion, I was able to see a side to Zuckerberg that others sometimes don't care to admit exists. The Mark Zuckerberg I saw yesterday was kind, intelligent, personable, and passionate about technology and its social application. He was not the arrogant misfit many want to believe created Facebook, nor was he uninterested in the ideas of others. Quite the contrary, he conversed comfortably and genuinely with the Senator, even probing him for his opinions regarding technology and the future of technology-related governmental policy. 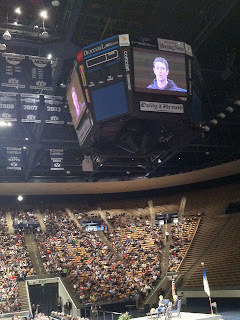 Ironically, Zuckerberg appeared more comfortable in front of the 10,000+ crowd than did Senator Hatch. When Zuckerberg asked what the government could do to help budding entrepreneurs, the Senator fumbled in his seat and awkwardly muttered about how he preferred to encourage innovation rather than restrict the Internet as “some in big business” might promote. Senator Hatch then spoke about Napster and his relations with Sean Parker, but for some reason failed to mention how his administration has fought against Napster, similar technologies, and nearly everything for which they have stood. Senator Hatch's INDUCE Act and his more recent COICA Act, for example, appear to combat copyright infringement on the surface, but would likely induce drastic consequences for many Internet-related technologies. Luckily, the savvy Marriot Center crowd saw right through the Senator's attempts at deflecting attention away from the chasm that exists between his politics and the ideals of openness and sharing for which Zuckerberg and Parker have firmly stood. Indeed, Mark Zuckerberg is a very intelligent person. Not only does he understand the business and technology behind Facebook, he understands and enthusiastically proclaims its secrets to success. “The thing people are most interested in is what's going on with the people they care about,” he said, reminding me of conversations I’ve recently had about openness and potential ways to improve OER distribution. Ultimately, “what we're doing with Facebook is as much psychology and sociology as they are technology.” Too right, too true. I guess in the end, it was Zuckerberg’s focus on the purposes behind Facebook that impressed me most. It was his attention to empathy (he discussed it twice during the hour) and how he hopes that Facebook will help people to better learn to care for and connect with one another. While he’s claimed in the past to be “trying to make the world a more open place by helping people connect and share,” I honestly believe him now. Not because I’ve now seen him in person, but because of the conviction and heart with which he taught those in attendance today. Steve Hargadon helped me make a major connection yesterday with his post detailing some of the things he's learned through his experiences with social networking. Likewise, Kathy Webb argued for a similar approach with IT Directors from across my state two weeks ago. During our semi-annual TCC meeting, Kathy tried mightily to get others to bite onto the idea of building an infrastructure that would enable teachers to not only find other professionals with similar interests and backgrounds, but share OER with one another. Sadly, I was among the few there that expressed much interest in Kathy's vision, or even in the idea of open educational resources and their potential in transforming the traditional learning environment. The day following TCC, Kathy and I continued our conversation at the UCET conference, landing on the idea that people are the key to sharing OER, not mandates nor strict expectations of artificial generosity. People network for the people, and once connected with genuine authenticity, people will naturally share in a community effort. Finally, this afternoon our District's Secondary Ed Tech Team met to discuss the challenges of developing technology-related resources that can be used by and for teachers as we continue in our District to adopt the Common Core. Being under a tremendous time crunch to begin widespread adoption of the Common Core Standards for Mathematics next year specifically, emotions ran high as the difficulty of the challenge was further understood by each of our Ed Techs. At the end of the meeting, I was pleased to see how well Jared Ward and others understood the potential of social networking in connecting others that might contribute to the production of legitimate resources. From day one in our District, I've wanted to create a mechanism that would allow our teachers to collaborate with similar teachers, in similar efforts, but varying school environments. While networks like Classroom 2.0 and even Twitter allow for teachers from around the world to collaborate about specific subjects, they fail to help teachers easily find other teachers that teach the exact same course with the exact same text (as if that were important) on roughly the exact same schedule. My dream would be to create such a system that not only tied into our District's SIS, but enabled easy collaboration while simultaneously providing an easy-to-use platform for natural OER distribution. True to Steve's advice that social networking be individually driven, teachers would never be required to participate, but by simply logging in, they could be instantly introduced to similar teachers with similar resource needs because the courses they teach are identical. Is it possible with a common national core, that the federal government might eventually produce such a system? Might that have been an eventual consequence of their developing initiative? I have no idea, but think there's tremendous value in collaborating with other teachers that share identical needs. With so much grownup talk about school reform these days, I think it can be easy to overlook the kids and the dreams they have about their future. Elev8ed.org is a growing site that just might help to amplify student voice. I really like where Ryan Bretag is going with his description of student (and teacher) resistance to learner-centric, technology-rich learning environments. But, I continue to see frustration from teachers that hear about this magical world and then face something different in the classroom. They face resistance. Because of this, we must help them with this reality. We need to help them understand why students are resisting. We need to remind them that community is at the core of a classroom not myths about what this generation wants. We need to acknowledge that this isn’t easy and it is even more challenging when you try to change the game in the midst of the class. We need to help teachers and students fight through it for a better environment that they might not fully understand or appreciate in the moment as they build and establish community. In seeing this list, I'm reminded of Mishra and Koehler's (2008) TPACK framework (see also Koehler & Mishra, 2005 and Mishra & Koehler, 2006). 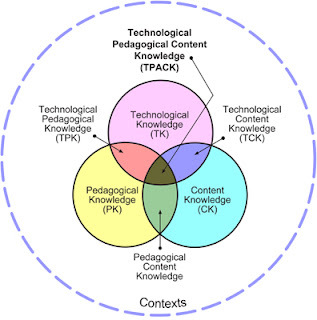 The elements of the Technological Pedagogical Content Knowledge (TPACK) framework include knowledge of content, pedagogy, and technology, as well as comprehending “the complex interaction between these knowledge components” (p. 2). In other words, learning to teach with technology is a skill in and of itself, requiring expertise above and beyond the traditional training in pedagogy and content that teachers receive in pre-service programs. While the TPACK framework itself is still under scrutiny, it feels right to me. My experiences in education have introduced me to excellent teachers that struggle to implement technology into their teaching. I've also known techno-geeks who can blow your socks off with their understanding of technology, but have no concept of effective classroom management or even basic instructional design. Ultimately, I think that many teachers still struggle to blend technology with effective curriculum delivery because - as Ryan points out - this is difficult business requiring complex skills not fully understood. Might TPACK, nevertheless - or something like it - also apply to student learning? Is there a technological/educational understanding that must be acquired before technology can be effectively used in the learning process? Do some students come about this proficiency far easier than others? What elements must be present before technology can be reliably used for learning? Finally, is it really community that lies at the core of a classroom? In the immortal words of every doctoral candidate, "more research is needed to answer each of these important questions." Koehler, M.J., & Mishra, P. (2005). Teachers learning technology by design. 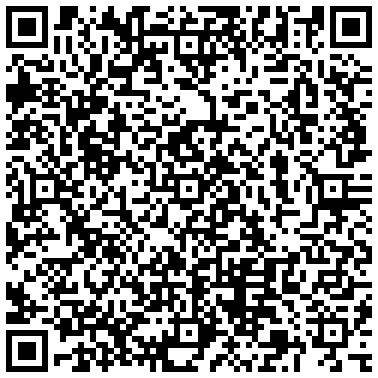 Journal of Computing in Teacher Education, 21(3). 94-102. Mishra, P., & Koehler, M.J, (2008) Introducing Technological Pedagogical Content Knowledge. Paper presented at the Annual Meeting of the American Educational Research Association, New York City, March 24–28, 2008. I've been thinking about Stephen and D'Arcy's comments lately, and the feelings they've shared about the importance of their personally-created online spaces. I can’t let myself play egocentric mind games with numbers. I can’t delude myself into believing this space is Important, or cringe popular because those things aren’t real, and don’t matter. From my point of view, the online spaces we create are extremely important, regardless of any numbers that might work toward quantifying that importance. 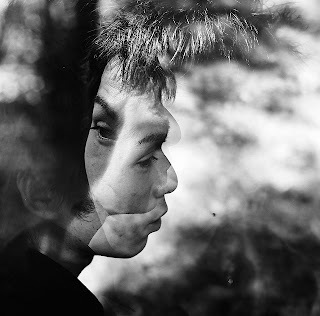 As a vehicle that enables my presence within the conversations that take place online, my blog, Twitter account, and other online creations not only serve as a locker for my thoughts, but function as a digitally-preserved representation of my inner self. Parker J. Palmer insightfully observed that "'We teach who we are', in times of darkness as well as light" (2007, p. xi). Similarly, the teaching we do while sharing online ultimately broadcasts who we are as people: infinitely important individuals who some eventually come to know because of those spaces we've crafted online. In the end, nevertheless, the quantification of our importance really is meaningless, much less insulting when attempted via Google Analytics. Are we, as humans, really so insecure in our relative performance to one another that we must incessantly measure and compare? To what end? While "progress," perhaps, is gained through adjustments informed by research, the liberating reality of life is that success in teaching and learning comes not in passing the test, but rather in grooming the soul. Through such grooming come college preparedness, readiness for life, and learning that sticks. I'm grateful to see that others in this world continue to "attach no more importance to measurable things than we attach to things equally or more important that elude our instruments" (Palmer, 2007, p. xiii). Now, if only more that share this line of thinking would continue to step forward and formally lead our schools. Palmer, P. J. (2007). The Courage to Teach: Exploring the Inner Landscape of a Teacher's Life. San Francisco: Jossey-Bass. Mere incomprehension of its potential, for both good and bad. Students that continue to stumble around in the dark. As a result, I've opened my personal Facebook network once again to people I greatly admire, people I greatly admire and have also met in person, people I've met in person who also share the same gene pool, and freaks that I met in high school who I just can't seem to hide from. 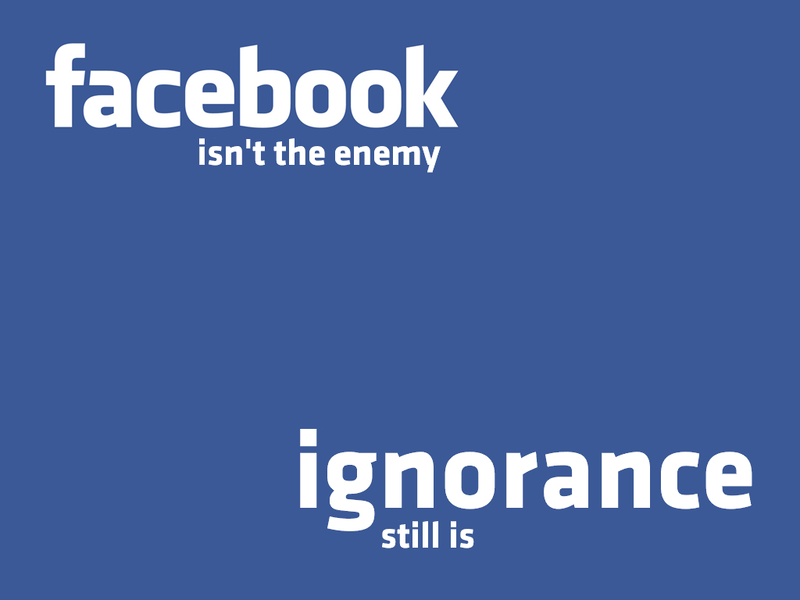 Over 600 million users later, Facebook isn't the enemy. 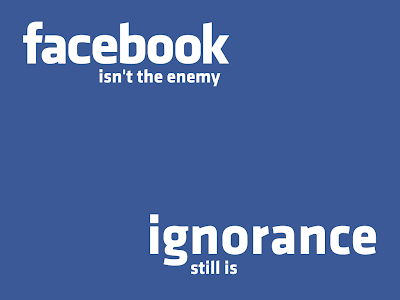 Ignorance still is. Beginning this month, we'll be unblocking Facebook in the Canyons School District. Professional development, policy refinement, and general therapy sessions will tag along. What are you and your school doing to face the enemy? Sometimes I wonder if increased global collaboration in education will result in increased homogeneity or if local school cultures will ensure diversity in learning environments. Deep thoughts for a Saturday night, I know.